Since I can't show any of my current knitting, here are a few of my favorite things from Other People this week. First is photophilic Jen's version of my Neiman pattern, only with SPACE INVADERS. I can't get over it... the fact that only one arm is patterned, the intricacy of the little guys, the fact that it's made in the same colors as the original but makes a very different impression. WOW. Oh, Grellow. I hope I find the time to make one of these for myself this fall. Whoa. I actually got the yarn for this one. 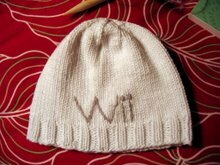 I wonder when I will find the time to knit it. Side and front view... one of those little yellow stars was my very first tattoo, gotten one day after I turned 18. Side and back view... the tattoo on the far left is the name of the Sumerian goddess Inanna, goddess of love and war, gotten during my Assyriologist days. So far so good! 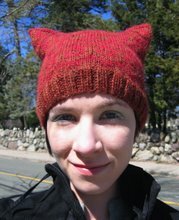 Here are a few things I knit while in Michigan, during all the time I had away from New Job. Now it's nose to grindstone and all that, which is fine, but knitting has slowed considerably. First, I made 2/3 of a Haven, from the Kim Hargreaves book "Heartfelt." I've wanted to use Rowan Cocoon for some time, in this creamy color, and this pattern struck me as a perfect match for the yarn. 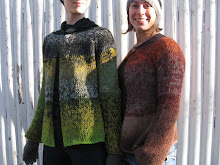 Plus, I saw all the finished Havens on Ravelry and read the glowing comments about its cosiness and knew I needed one. It's been a great companion during the Olympics because it's nearly impossible to err, the pattern is THAT EASY. Next, a second square for my blanket (this group participation is catchy), designed by chaimama. 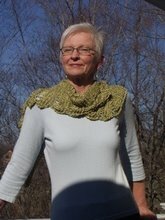 This one is made of Cascade 220. Hey, check out how well the Cascade 220 has maintained the fold lines from my suitcase! That's one crisp yarn. Anyway, this is soaking in the sink as I write. The biggest accomplishment, however, is still a secret... I'm waiting for the yarn from Little Knits that will let me finish it, hopefully in time for a rapidly approaching deadline. 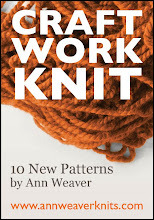 It's a new yarn for me that I think will be new to just about everyone else, too, and I can't wait to show it off. Have you been watching the Olympics? Chris drew some inspiration from men's gymnastics for this shot I took during one of our hikes in Michigan. 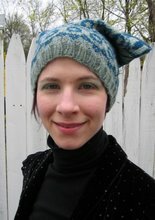 What were YOU knitting in 1996? Sorry for the blog silence... I've been in Michigan on vacation since the 8th and decided to just stay away from the computer. I did produce a few pounds of knitting (seriously, watching the Olympics makes the knitting just fly off the needles, I've found... that and not having to go to New Job), which I'll post next. For now, however, here's a little something saved from my New York University Art Major days, one of many "guys" I knit freeform, in one piece, and stuffed with polyfill. This got rave reviews from professors, but I'll let you all draw your own conclusions. Sometimes it's nice to be part of a group. But other times a lonely mitten is appropriate. I don't tend to do well with knitalongs and knit nights and such; anything that requires a schedule is accompanied by a queasy "work" feeling. 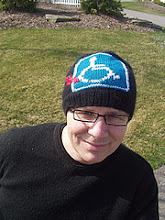 However, I've successfully taken part in a group knitting project in the Yarnplayers group on Ravelry! Great success! The project was to design a 13" by 13" square for a blanket and write out the pattern, so that others in the group could make your square and, in the end, have a stash blanket with squares designed by a number of people. So even though it's not July (was supposed to have this done by end of July), here's my square! And here's how you make it. Mine used Malabrigo in a dark blue color, about 1/3 of a skein, for the Main Color, and Lorna's Laces Shepherd Worsted in Fir (just a bit) for the Contrasting Color. Note: YOU NEVER KNIT WITH THE CC. You just weave it through your knitting. It's pretty cool. Using Size 9 US needles and MC, CO 54 stitches. Work in garter stitch for 2.5". Row 1: Knit 1 row with MC. Row 2: With MC, k the first stitch of the row, p until the last stitch, k the last stitch. Row 3: With CC, slip 1 with yarn in back (sl1wyb), slip 1 with yarn in front (sl1wyf), repeat this sequence to the end of the row. Row 4: p the first stitch, then sl1wyb, sl1wyf, repeat to end of row. Rows 5 and 6: Repeat rows 1 and 2. Row 7: With CC, sl1wyf, sl1wyb, repeat to end of row. Row 8: p the first stitch, then sl1wyf, sl1wyb, repeat to end of row. Repeat these 8 rows 3.75 times (I ended after finishing row 6 to get 7 woven stripes, because I like prime numbers) or more, if you like. Change back to garter stitch and work in MC until piece measures 10" from beginning. 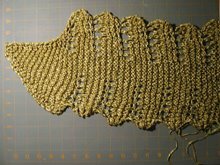 Change to CC and work in garter stitch until piece measures 13" from beginning. Cast off loosely. TA DA! Add this to blocks of your own design, or other Yarnplayers' blocks, and soon you'll have a blanket that is knit is pieces you can carry with you. From Mostly Mittens, design #13, I believe. Noro Silk Garden Light and something called "Tove" that's sport-weight wool. Designs are coming along. At least one of them will be up... for free! this fall.